Located near Vail, Colorado, the Eagle River whitewater rafting experience offers a variety of paddling for all levels of boating. Because the Eagle is undammed, water levels fluctuate daily making each trip down the river a unique experience. After a few hours on the river, you’ll still have plenty of time and energy, so check out some of the other great activities in the area. Vail and Beaver Creek are outdoor adventure destinations with a range of activities. Choose from guided activities like horseback riding and fly fishing. If you would prefer something less structured, consider one of the many hiking trails, mountain bike trails or paved recreation paths. Those interested in group activities have options like golf and tennis. 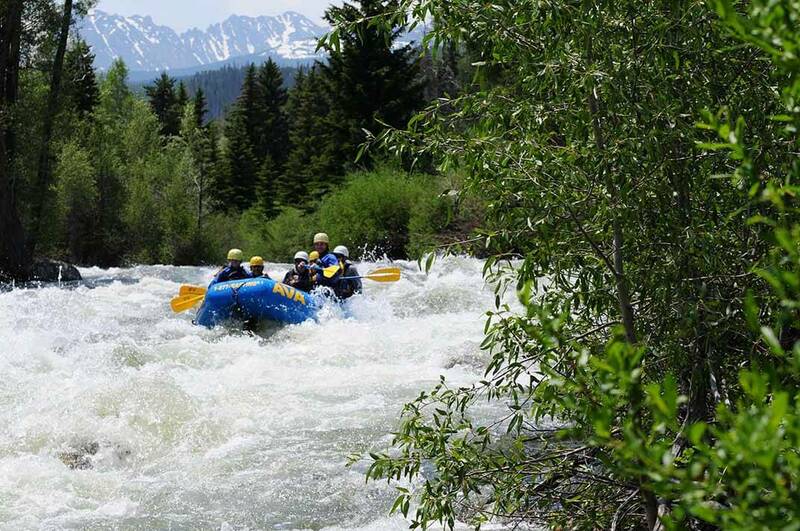 Rafting on the Eagle River of Colorado is conveniently located in Vail, Colorado, just miles away from various other popular destinations such as Beaver Creek, Breckenridge and Keystone. With morning and afternoon 1/2 day trips, you'll have plenty of time for a hike, shopping and more before and after your trip. Eagle River Rafting has something for everyone. If you are looking for something mellow with a few exciting rapids, the Lower Eagle trip is perfect for you. You'll spend about 2 hours on one of Colorado's few undammed rivers. Ready for something more intense? The Dowd Chute trip offers continuous, action-packed whitewater. When you are going rafting make sure you wear quick drying materials and no cotton. You can wear a swim suit for under your wetsuit or splash jacket. Wool or waterproof socks are a great under a pair of old tennis shoes. Make sure your shoes can get wet, and don't wear crocs or flip flops for your trip. You can travel lightly when heading to your rafting trip. We do recommend bringing the following: sunscreen, sunglasses & croakies, water bottle, and dry clothes to change into. If it looks like it will be a bright and sunny day (which it usually is) you can bring a hat to wear under the helmet if desired. When can I raft the Eagle River? The best time to raft the Eagle river is between May and July. Depending on the season you may be able to raft the Eagle River in August. How far away is the Eagle River from Denver? The Eagle River is about 100 miles from Denver and takes about 2 hours to 2 1/2 hours to drive there. What is the minimum age for rafting on the Eagle River? The minimum age for rafting on the Eagle River is 6 years old. Different sections of the river have different age minimums but guests as young as 6 can raft the lower Eagle River section. The upper sections, Dowd Chutes, are technical with more continuous whitewater while downstream the rapids on the Lower Eagle spread out and become more forgiving. These half-day trips run in the spring as the snow melts and swells the rivers. Looking for beginner whitewater? On the Lower Eagle, the small holes and splashy wave trains provide plenty of rapids and opportunity to get wet! This is a great whitewater trip for the whole family. Minimum age 6, minimum weight 50 lbs. Looking for a high-adrenaline challenge? Dowd Chute won’t disappoint. You’ll experience some of the most aggressive and thrilling early-season whitewater in the state. Minimum age 16. Good physical fitness required. Need a break after an action-packed day? Consider a relaxing spa treatment at one of the many world-class, local spas. Spend a few hours window shopping the various boutiques and art galleries or refuel at one of the many fantastic restaurants.